Xtival Autumn Rock Band: The Beatles Band Battle! Relive those classic tracks! Play through on your own or with friends to earn the highest points. The higher the points, the better your chances! To enter, all you need is a band. Your band can be 1-4 players full, the more people you have the better chance you got at winning! Play the select songs given for the competition, grab a screenshot/take a picture of your groups highest scores on each of the songs and submit them to myself over the weekend. Don’t rush yourself though! Entries will be accepted from Friday 27th November starting 10am through to Sunday 30th Nov at 10pm. All I need is the images of your points and your team and its that simple! – Bands must be signed up before Thursday 26th November. – You and your band mates must be members of Xboxliveaddicts.co.uk and have valid Xbox Live Gamertags. – Signing up requires posting in this thread with your forum username(s) and gamer tags. 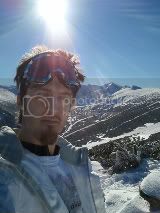 – Score entries must be sent to the email address (mechrxbla at live. dot co dot uk) within the allotted time of the weekend event, please try to bunch the images together in one email rather than sending separately. – Substitutes are not allowed. If someone doesn’t show up, you must continue with the group you have. – Difficulties can be set to what your comfortable with, remember the harder you try, the better chance you have! – Microsofts Code of Conduct and our forum rules apply. For the winning team, theres up to 12,000 Microsoft Points and 2 years worth of free live to share between your band! Tune up and Rock out to the summers hottest party game!!! Being 6 months late for us over the seas in Europe, Rock Band’s delay and then price was not laughing matter. So has Rock Band got us cheering for an encore? With the split between Red Octane and Harmonix a shock for the future of Guitar Hero, we were laid to rest with the release of GH3. But a few of us also wondered about developers Harmonix, they’d been very quiet and working away on new projects. Shortly after Rock Band graced the American shores, an ingenious mix of their hit Guitar Hero, the ever popular karaoke classic Singstar and what’s that?? A drum kit!? Eagerly awaiting the game the UK and Europe patiently waited for our release, some gave up hope, some stayed passionate to wait for the release, and finally, six months down the line and after one hell of a pricey tag on it the game finally came to our retail stores for us to rock out with our friends. The game obviously still has the main focus of what Guitar Hero had started with the pressing buttons in the correct sequence on a guitar shaped controller to some of your favorite tracks of old and new. 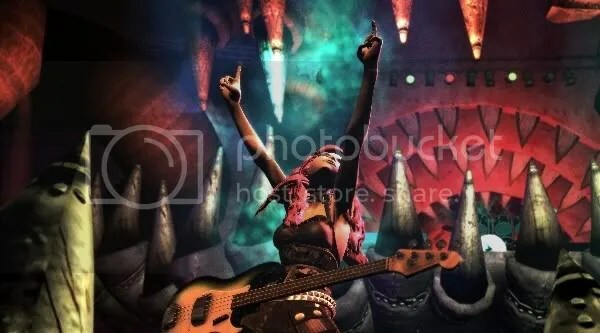 What makes Rock Band different is the game incorporates the singstar style of singing, where you must wail into a microphone and hit the correct pitch to gain points and not be kicked off stage. Obviously getting the words right makes the game a little easier, but humming or ooohing in the right tune also get you through. With Rock Band comes the new Rock Band guitar. Being sponsored by Fender the typical Stratocaster shape has been used. The style of the buttons have been changed and features like a pick-up switch which changes the effect style of your solo’s has been included. During the songs you’ll often reach the solo. This is shown by your HUD turning blue and a percentage counter appearing for how many notes you hit. This is the ideal time to use the ‘solo buttons’ which are found further down the neck, here you can play the notes without having to strum, although children or people with smaller hands can also use these for the full song. With all of the instruments comes the use of ‘Overdrive’, which is RB’s take on star power. For guitar, drum and bass you must hit all the notes which appear in white to get a section of the power, for vocals you must sing a verse perfectly to get some of that juice to unless some multipliers and rack up those points. Overdrive can also be used if your band mates mess up too much and fail. Failing is allowed 3 times for each player provided that there saved in time not to fail the song. The Guitars Overdrive can be activated by striking that ‘LETS ROCK!’ pose and raising the top end of your guitar in the air! Hey! Hey! I wanna be a rockstaaar!! Fortunately if you don’t have a Rock Band guitar and have GH, you can use those controllers to play Rock Band, which is good for when your mates come round…no-body ever wants to but…someone’s gotta play the Bass. If you’re brave enough to sing your given the top half of the screen in multiplayer or the bottom half in single. Your vocal line appears within the bars and the correct lyrics are shown and you have to sing along to get the points. Your Overdrive power can be operated by singing or making noise when your bar has a yellow effect around it, this gives you your extra points whilst you’re squawking away. I mean…singing. Honest. 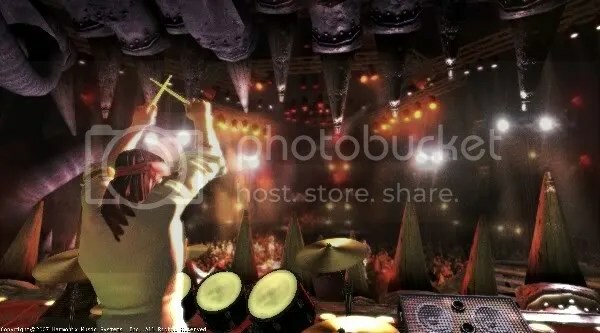 The drum kits also keep the same style of the playing the guitar but to make use of the drum pedal, Harmonix dropped the HUD for drums to 4 coloured bars and the drum pedal to be highlighted as an orange strip going horizontally across which must be played like you would a real drum kit. To deploy your Overdrive you’re occasionally given a drum fill to perform, this can be played however you like and as long as it ends with the green symbol your power will be activated. These custom drum fills appear once you have the minimum amount of overdrive that’s required. The single player mode stays true to GH tradition in which you play through set lists with your band until you reach the harder songs. These 5 song set-lists increase in difficulty and length as you progress and whilst having the same songs, the order of difficulty is changed depending on which instrument you use. Guitar, Vocals or Drum kit. Also sticking with tradition is the 4 difficulty settings; Easy, Medium, Hard and Expert for each instrument. The multiplayer side is where the big fun starts with the ‘Band World Tour’ now its important to mention that unfortunately this game mode is Local multiplayer only meaning your going to have to bring your mates over for some hefty Rock Band sessions. Band World Tour basically is where you and 2-4 of your friends make a band. You chose a name; create a character each with the new and in-depth custom character modeling section and then start playing songs in a city. Each city must be unlocked and within these cities are venues varying from small clubs to bigger arenas. Obviously starting out in the clubs, you’ll find yourself returning to the older cities to play the big events later on. In each venue can be one or two songs separately and a few bigger set lists which can be made up yourself or complete random selection from the songs you have on the game and DLC. Whilst playing this, you’ll have to gain fans and stars to unlock new stages. You’ll find yourself having to get a manager, and many other people to join your team to unlock more and more things to play. Now, if you don’t have many friends to play this fun game mode then if your really good with the instruments you can try combining them and playing them yourself! Online really consists of ‘tug of war’ matches where players must fight to get the most notes and quick play games where 2-4 friends can all play together on songs of their choice. The tracks are plentiful and if you cant find a song you know or like in the standard set list a healthy dose of new songs every Tuesday will surely get something you like to play. The songs play clearly and 90% of them are Master tracks, rather than covers. The game looks a lot more nicer, GH’s cartoony approach worked well, but the visuals with Rock Band make it look more of a better game, the band members act out with the music and everything just looks a lot more serious, not so much realistic, but more of a serious tone with where the game goes. Guitar Hero also had different designs for the ‘fret boards’ where your notes would appear. And the designs would change with each character. Rock Band have not included this and left it as a translucent black block, which makes focusing on the notes and colours a lot easier for some. The HUD with what you have to play is a lot clearer to see and on a HD TV looks clean and crisp. 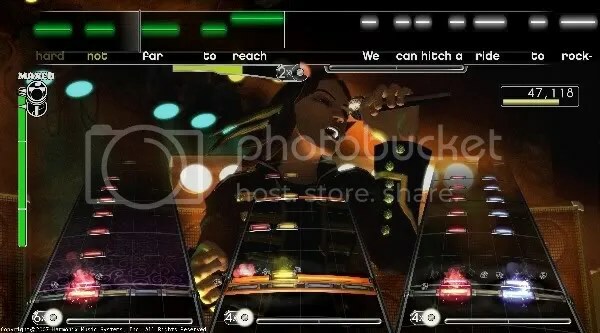 Veterans of Guitar Hero may find getting the timing of the icons a little difficult at first, as each note is represented as a small block rather than the big circles you may be used to. The background is always showing a part of the show whether it be your drummer whacking out a crazy drum fill or your singer and bassist singing the songs into a mic together and keep those who are just watching you play just as entertained. Whilst the Single Player tours really rely on your determination to improve and/or your skill at these games. The multiplayer Band World Tour will have you and your friends at it for ours, especially when you give the Endless Set list a try. Whilst its still unfortunate this mode isn’t online it makes Rock Band one of the ultimate party games to bring round with your mates. As well as this, as previously mentioned each Tuesday see’s a new batch of songs for you to dlc for a small price each and rock out to. If you’re through with standing in lines to clubs you’ll never get in, or feel life’s like the bottom of the ninth and you’re never gonna win. Rock Band might just be the game for you. If you’re new to the whole Guitar Hero/Rock band style of gaming, Rock Band might just be for you, if you want a great local multiplayer experience, Rock Band is the game for you. Though definitely worth searching around in the stores for the cheaper deals that you can get. With summer coming round the corner, Rock Band is definitely one of the games to get for 2008. Link to review – See link for more photo’s. 7.00am – A groggy Mechanical wakes up…Grrrr. 10.15am – After a good hour and a half going down the motorway and tada! We reach the (hard to miss) Wembley Stadium. I take a look at the queue and shudder. So where’s the rest of them you say? Oooooh rooney where are you?!!? 11.00am – Rooney, Jonesy and Jonesy’s missus turn up…talk about late �_� Still, the queue had shrunk a considerable amount so i figured it was worth the wait. We get in and my oh my was it a sight. Race Driver GRID play area with a massive TV showing the trailers. EA section featuring games like Army of Two, Fifa Street 3, Burnout Paradise. And trailers for Little Big Planet and other games. On the main stage had bands playing. I wasnt aware of the first fews names but the final one was Elliot Minor. After making our way around checking out everything there was to see, had decided to get ourselves in the ever-lasting queue for a go on Rock Band. Me on Guitar, Rooney on Drums and Jonesy taking it eaaaasy on the bass. Not long after being in the line an organiser of the Rock Band stage (the smaller one seen in the picturs of Darce, Daz and KT) approached Rooney and asked out of our group who was the Lead Guitarist he pointed towards me and the guy asked me if i could sub in for another band as bass. I took up the challenge assuming I’d just be joining these guys in testing the game out. Sorted. I get to play the game a bit and get an opinion on it. The guys tell me to follow them and we walk down the stairs towards the larger of the two rock band stages. I start to get a little nervous being I’ve never played Rock Band before. Sure im good at GH2/3 and can nail things on Hard and Expert fine, but playing a new and slightly altered game infront of a large crowd? That was kinda dodgy. Yet to my suprise we walk past the stage and further round to the main stage where the bands were playing. I stoped and said to the other band mates ‘Wait…we’re not playing it up THERE are we?’ They all laughed and said yes. Turns out, I’d been drafted into playing bass in a ‘Battle of the Rock Bands’ between us and another group. Oh. Dear. They’d finally finished the song with a fairly low score and after experiencing a fair amount of glicthes that paused the system we were informed of what to watch out for to avoid the glitch and good luck. So with the lovely Gemma Atkinson introducing us on, we took the stage and began our song Learn To Fly – Foo Fighters. We managed half way through the song until the glitch began to hit us. Unfortunately, none of us seemed to be causing it, and with our score drastically higher than the first band, after the glitch came up too much, our song was cancelled by the Stage Manager. It went down to a ‘crowd cheers the highest for’ and Iain decided on Band 1. As gutted as we we’re we were glad to be able to take part, it really makes a difference to be on the other side of that kind of gaming (like filmed leagues you see on TV) and although we felt a little cheated out, our band accepted the decision and we were cool with it. The first band were awarded with an Xbox and once released over here, each will be recieving a copy of Rock Band with all the instruments. My band were also rewarded (because we were obviously better) With an EA goodie bag and a free EA game of our choice. We were more than pleased with thier generosity at that. So good on you guys EA. Ill think of you guys when i get Battlefield: Bad Company through the post once its released. 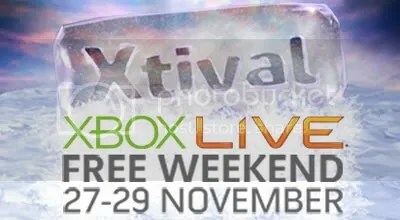 After that, i rejoined our XBLA pack and we’re searched for more things to see and do and for more free stuff to hoard. Me, Rooney and Jonesy managed to grab the second to last spot on Rock Band and after me getting some giggles and flirty looks from the 2 Rock Band girls in control of it (They laughed at our band name ‘XBLA Rockers’ which she pronounded ‘Rockies’) We rocked out to the choones of Queens of The Stone Age’s – Go With the Flow, but failed both times because Rooney couldnt beat the drums to save his life. Overall the day was absolutely great. Got to meet and speak to more of our great guys at XBLA and i got to meet some new guys that we’re in my Finalist Rock Band too.